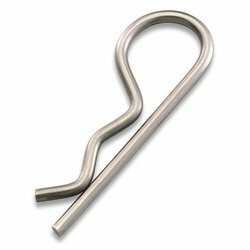 We manufacture R Pins using premium quality material such as stainless steel, copper and brass. With the help of advance technology and skilled professionals, we are producing one of the best all size durable pins. Being a quality-oriented organisation, we offer premium quality R Pins to our customers. R-Pins are being offered by us at market leading prices. We offer our customers with R Pins that looks like the alphabet R Pins. We manufacturer Double Coiled R Pins that are mostly used for extra strength.